If you ask a dozen people what the key for success in a leadership role is, you’ll receive a dozen different answers. Every leader has their own style, and every role comes with its own set of requirements. The unexpected loss of a leader, due to personnel changes or retirement, can create a gap that is hard to fill, even if a company believes they are well prepared. This difficulty grows exponentially if a company is unclear on the characteristics that made that leader so successful in the first place. A good succession plan always begins by identifying the most critical roles in your organization, which create a starting-point for your process. Once you are clear on who would have the most impact on your organization if they left tomorrow, you can begin to understand what that role truly entails, and what a successor would need in order to flourish. Understanding this profile of success will allow you to begin nominating succession candidates and preparing for their growth and development. SIGMA has created a Success Profile worksheet that allows you to fully explore the knowledge, skills, experiences, and characteristics that are required of any given role. This comprehensive look allows you to gather all the information about a single role in one place to begin to evaluate who might make good succession candidates for a given position. It also sets the standard for training and development for these candidates. 1. Success Profiles should be based on the role you anticipate having to fill. It can be easy to confound the role with the person currently occupying it, but this is a chance for a fresh look at the position. Consider the job requirements, tasks, and expectations for this role. What skills or experiences are needed in order to satisfy these requirements? What traits or characteristics would help a person excel at these tasks? Some of these will overlap with the characteristics of the current incumbent in the role, but there may be some new ideas to come out of this process. 2. Planning for the future begins with creating accurate Success Profiles today. The best place to start with creating a Success Profile is to consider: if I had to select someone for this position today, what requirements would I want my new hire to fulfil? Think beyond their general skills or qualifications to their personality and other characteristics. After listing the current requirements, begin to think long-term. Consider how your organization may change over the next five to ten years. How will these changes impact this particular role? How can you best prepare candidates to succeed in a changing environment? Use this as an opportunity to build your organization’s strategic plan into your succession planning process. 3. Gathering more information will improve your Success Profiles. A Success Profile begins with the incumbent, and should look to the things a current employee does well for examples of characteristics to include in the Profile. Your Succession Advisory Team should also be involved in listing the competencies for the current and future requirements of the given role. However, consider looking beyond your senior management team and the current incumbent as sources of information about a role. Ask leaders, colleagues, and direct reports for their input. Consider other positions or departments that have frequent interactions with the person in this role and ask for their feedback as well. Gathering information from a variety of sources will ensure you create a well-rounded and informed Success Profile. 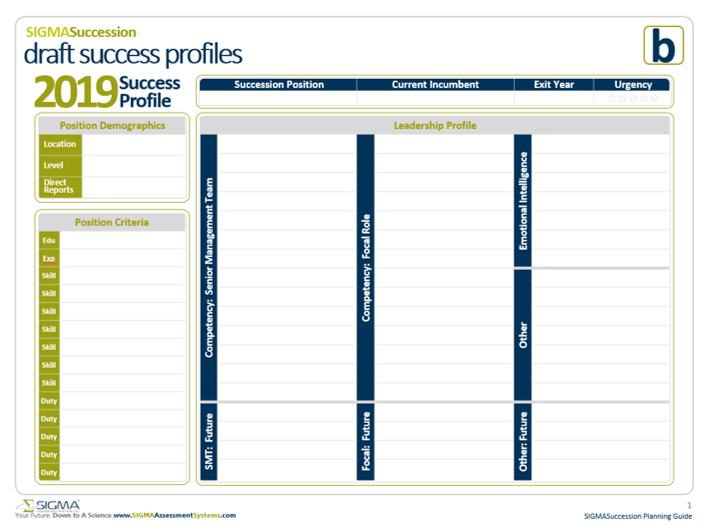 The Success Profile Worksheet is a simple but powerful tool to help you define and understand the critical roles in your organization. First, clarify the need. Across the top of the worksheet, fill in the title of the position and name of the current incumbent in the role. Based on your conversations with this person and their retirement eligibility, indicate their likely exit year. Use this timeline to indicate how urgently you need to prepare a successor for the role. If your incumbent plans on staying for at least five years, you can indicate a low urgency; if they are leaving in three to five years, this would be considered medium priority; and if the incumbent intends to leave in the next three years, you need to urgently and immediately plan for their succession. When in doubt about exit plans, it is safest to plan for the worst and assume a role is in urgent need of attention. Along the left side of the worksheet, fill out the demographics and criteria of the role. This basic information should be based on the job description for the role. Include information like the education and experience needed to be considered for the role, the skills a candidate should have demonstrated in the past, and the duties they might be expected to fill. Finally, you can develop the target leadership profile. Use this space to list all the personal requirements, qualifications, and characteristics a person should have in order to be successful in this role. Use both the information you gathered from the incumbent and other sources, as well as scientifically-validated measures to add objectivity to this process. This will provide your organization with a benchmark on which to evaluate, develop, and monitor the progress of your successors. SIGMA has a range of assessments available to help you create a Success Profile that is effective, evidence-based, and tailored to your needs. Remember, the Success Profile is a live document that can and should be updated regularly. This document is your tool for understanding your critically important roles, and builds a foundation for your Succession Plan.